Though I was only 10 at the time, this episode really brought back memories of this period. Even at that age, you start thinking "wtf is going on around here?" And we haven't gotten to Chicago yet. That really opened this child's eyes. This was fascinating. I'd known of Tet as a major turning point in the war but I guess I'd never grasped exactly how. 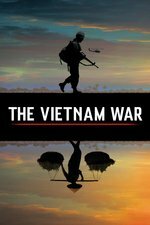 That it was in fact a military failure for the North Vietnamese, but a public relations failure for the American government. The footage they got here is incredible. I heard a bit on NPR's Fresh Air about the footage surrounding the one street shooting from which the famous photograph came. The film was from NBC, and it did in fact air on US television one time. They negotiated with NBC to get it with the condition that they were only allowed to include what actually aired on TV, down to the frame. That footage is so gruesome it's hard to believe NBC ever showed it on TV at all. And speaking of gruesome (and weirdness), after all of the death and bodies and blood and gore on this program, I absolutely did not watch Nguyen Van Lem's shooting. Had to turn down the volume and cover the screen. I haven't come close to tears yet with this program. What I did really feel though, was when the massacre was revealed, seeing the one woman throwing her hat in frustration seeing her dead loved one(s), and another woman just throwing her hands up and letting them fall limp like "why? what is it all for?" I have no idea what she was actually thinking obviously, and she could have been thinking anything, but in that moment it just felt like a soul crying out why? why do we do this to each other? They probably used this footage of my stepfather being asked about killing the last sapper at the embassy. He's on at 01:22. My mom dated him for 7 years before he asked me if I would be OK with them marrying. We hosted dinner parties with guests like Neil Sheehan, John Paul Vann's widow, William Colby and yes Nguyen Ngoc Loan. I don't support killing prisoners but I hope you all know what the shot man did. Six children. I'd do it too. I haven't started watching the series yet and I'm not sure I need to but I will. The image of the shooting had a different context in my household. It was justified and merciful. My parents were caught in the offensive in Saigon. Door to door fighting, frantic driving and bad encounters. The shooting? Yeah, they made sure to tell me about what the shooter did so I could not give any sympathy. I still can't.